Attackers tried to set it on fire. Unidentified individuals attempted to set a Roshen confectionery store on fire in Kyiv's Gagarin Street on the evening of 20 March by throwing a bottle with an explosive substance at its window. Fortunately, it did not catch fire, smudging the window with soot, according to the Informator news website. 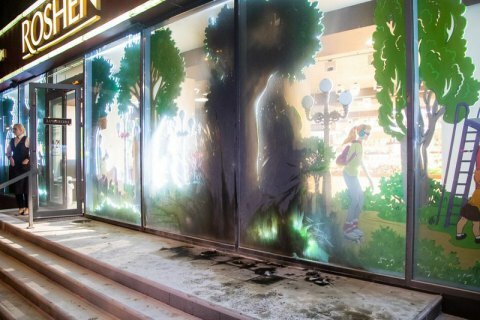 Two other Roshen stores survived arson attacks on 17-18 March. The Roshen confectionery corporation is associated with incumbent President Petro Poroshenko.